The Department of Public Safety & Transportation strives to provide 24-hour safety, security, parking & transportation services for Saint Mary's College, ensuring that everyone in our living, working and learning community can thrive and succeed. Download LiveSafe for emergency alerts. The application is available on Apple and Adroid platforms. Hours: Monday through Friday, from 9am to 4pm. 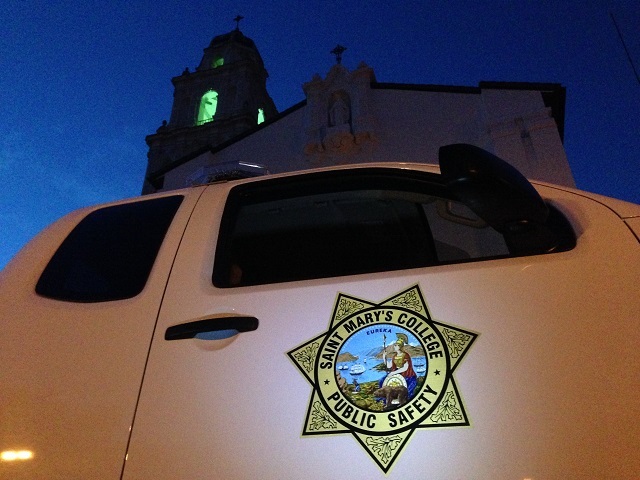 Welcome to The Public Safety & Transportation Department of Saint Mary's College of California. We are here 24 hours a day, 365 days a year to help maintain a safe and secure environment for our community to work, to teach, and to learn. Feel free to call us any time you have a need for our assistance, or even if you are not certain where to get help. PARKING PERMITS: 2018-2019 Parking permits are available for applictation on-line. Got to your "my.stmarys-ca.edu" page and look for the parking icon (it looks like a car).